An extensive selection of quality assurance applications streamlines and simplifies hot lab administration requirements. Easy to use, easy to understand. 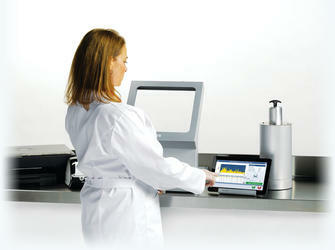 The Atomlab® Wipe Test Counter is easy to use, easy to understand, fast and dependable. A touchscreen display utilizing intuitive software eliminates the tedium of wipe testing. Simply perform a daily calibration and background count, then count the wipe for each predetermined location. Trigger levels can be set for any isotope at any location including 200 dpm for iodine. In seconds the system will determine if the location is above or below the user defined trigger level. When performing a wipe test, the full spectrum is displayed. A wide window that includes the isotope energies expected in a particular department is set by the user. The efficiencies of the isotopes selected for the window can be either factory defaults or user determined using an integrated detector efficiency program. Individual isotope ROIs along with the wide window can be set. This feature helps identify the isotope(s) causing contamination. The user may define an unlimited number of “Area” names and wipe “Locations” and designate them as restricted area, unrestricted area, sealed source or package. The Wipe Test Program automatically calculates net contamination levels and reports results in dpm, uCi and Bq. The system consists of a lead shielded 2" x 2" sodium iodide (NaI) well detector and a 64 channel multichannel analyzer. The displayed energy range (spectrum) is 0-800 KeV, which is typically found in nuclear medicine departments. The wipe counter is designed to meet or exceed all NRC (10 CFR 35.70, 10 CFR 20.1906 and 10 CFR 35.2067) and state wipe test requirements. There are automated programs for the quality assurance functions: calibration, FWHM, chi-square and minimum detectable activity (MDA). Wipe test results and QA test data can be stored in memory and printed at any time. 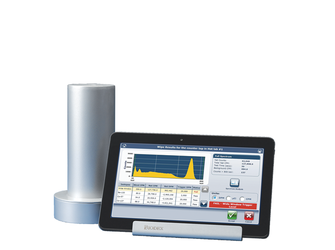 For performing sample counts and analysis beyond the scope of the standardized programs. In addition to providing “standardized” programs for routine test and survey procedures, the Atomlab Wipe Test Counter now offers a “manual” program to accommodate other counting and spectrum analysis tasks. The user can select from three counting methods: preset time, preset ROI counts, and continuous counting. After any count, the Spectrum Analysis option can be used to produce a Spectrum Analysis Report. The monitor shows when a test is in progress, and graphically displays the spectrum, time, counts and cpm. Communicates with most commercially available NM management systems. All-In-One Flat Panel Touchscreen Display with Windows 10 Operating System and USB connectivity. Memory: Stores wipe, calibration, background, high voltage, isotope specification, isotope efficiency, Chi-Square testing results, technologist list, wipe locations list and latest MDA calculation. Results can be displayed and printed.